Unlike other main configuration management tools, like Chef and Puppet, which require you to install the tool on all the nodes i.e. the contoller/manager node, as well as the managed nodes. Whereas, to use Ansible you’ll be required to install it only on the master/controller/manager node, the one which ‘ll be performing provisioning on all the other nodes. EPEL (Extra Packages for Enterprise Linux) is an open-source and free community based repository maintained by Fedora team – lists a lot of open-source packages for Fedora, RHEL (Red Hat Enterprise Linux), CentOS, and Scientific Linux. Ansible is also available via EPEL repo. To perform any deployment or management from the Ansible controller to the remote hosts first we need to create and copy the ssh keys to all the remote hosts. For password-less access you need to share the Ansible controller’s public key i.e. copy the key to all the remote hosts, where you need to perform provisioning. Once the private-public key pair is generated, next is to place the public key on the remote servers that we want to use (for a password-less and secure authentication). 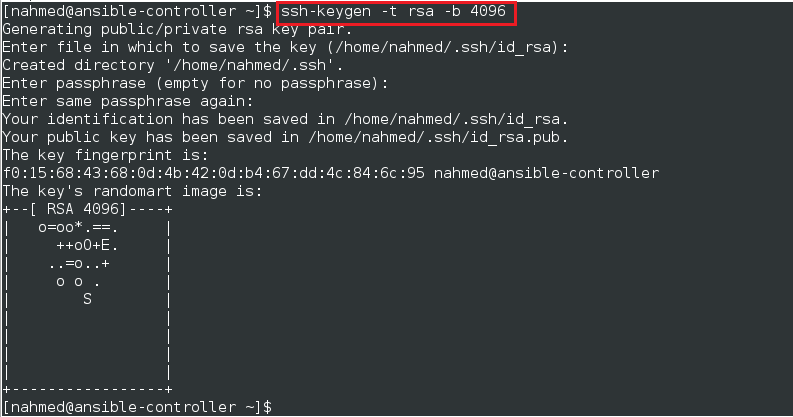 It is required to add the public key (content of id_rsa.pub) in the remote host’s $HOME/.ssh/authorized_keys. The recommended way is to use the ssh-copy-id command, you need to specify the user and host, and it’ll copy the key i.e. add it to authorized_keys. Let’s now verify if ssh authentication is working fine, by ssh-ing into the remote servers. The ‘test-servers‘ in the brackets indicates as group names, it is used in classifying systems and deciding which systems you are going to controlling at what times and for what reason. Ad-Hoc – executing a task (command) on the remote host using Ansible’s comman-line tool. Using Playbboks – permanently writing plays (group of tasks) for all or specific hosts or host groups, using YAML configuration specification language, that can be re-used and put to version control.